Our kitchen hasn’t gotten below 90 degrees in over a week, so we have been trying to spend as little time in it as possible. 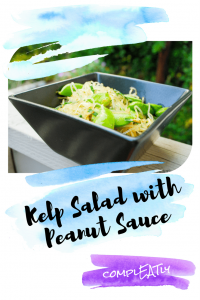 This salad only requires 1 pair of scissors, 1 bowl, and a fork for scooping the peanut butter (sure you can use a spoon if you prefer, but you can reuse the fork to eat the salad at the end if you want). This salad is easy, takes less than 5 minutes to make, and is the perfect combination of refreshing and satisfying. In a large bowl, stir together the peanut butter, soy sauce, and rice vinegar until smooth. Using a pair of scissors, cut the chives into the bowl. 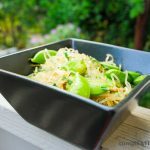 With the same pair of scissors, cut the kelp noodles into 1-2 inch pieces. Using your hands, toss the noodles until they are coated in peanut sauce. Break each snap pea in half, and toss in with the rest of the salad.